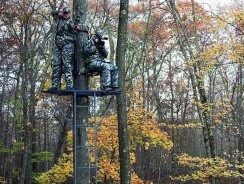 For many hunters the best tree stands will depend on the situation. Depending on your environment, what you’ll be doing and how much gear you have – you’ll need a stand that is able to accommodate these factors. Hang on stands, ladder stands and climber stands are different types of tree stands that each perform better in certain situations. The best hunting treestands will therefore be tailored to your personal needs while you’re hunting. A long debate in this field has been between climbing tree stands and hang on tree stands. As said above the best tree stands depends on the situation, however there are some general qualities that go in to the best stands. You’ll always want to look for the stands that are made out of high quality materials. When looking at the seats and platforms of different stands, take into consideration factors like the material being water and UV ray resistant. Take note of how portable the stand is, check to see if it folds and how much it weighs. Try and estimate how easy it’ll be to move when you have all of your gear. The best treestands will easily pass these tests. The best tree stands also go the extra mile by making sure the materials it’s made out of last multiple seasons. 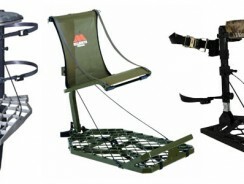 Looking at things like the strength and quality of the harness, the materials the stand is made out of (steel, aluminum, sound-deadening alloys) and its safety features are all general indications of a good stand. User reviews of stands are also a great way to get some insight on how a stand will likely perform. Research is the best way to guarantee your investment when buying a tree stand. 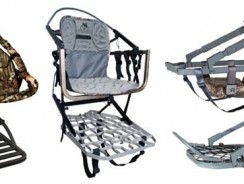 A lot of hunters say climbers are the more versatile choice in terms of comfort & maneuverability. Hang-ons are the best tree stands when you are setting up multiple stands in one area. The most ideal situation is to have multiple hang-ons in one area and a climber stand to quickly adapt to the best positions. 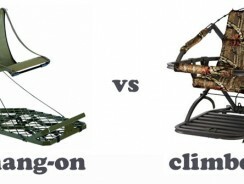 Since each has their own uses, using both types of stands in combination is the most effective way to get the most out of your treestands. When looking for the best tree stands always make sure you spend the time to research its construction. Don’t just stop at the superficial features; dig in to the stand’s construction and what other people have to say about its behavior over time. 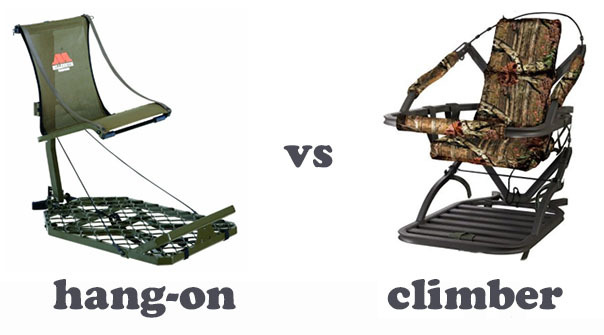 When looking for the best treestands, either hang-on or climber, the quality of the materials is the main thing you want to be looking at.